Ambulance staff in Bromley taught members of the public how to help somebody who has collapsed and stopped breathing. An Ilford man, who made abusive telephone calls to a London Ambulance Service enquiry line, has been fined £500 and given a two-year conditional discharge. A Mill Hill father of two is “the happiest man in the world” after meeting the ambulance crews who helped save his life. Ambulance staff in Bromley will be teaching members of the public how to help somebody who has collapsed and stopped breathing. 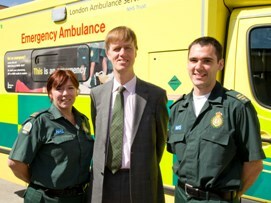 East Ham MP Stephen Timms was reunited on Friday (3 June) with the ambulance crew who treated him when he was stabbed last May. 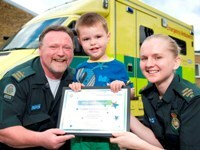 A four-year-old boy from Barnet was praised by an ambulance crew after calling for help when his mum was injured.